Matching thread colors is often cumbersome without hard-copy thread charts. Though embroidery thread manufacturers such as Isacord and Madeira have readily available online thread charts, computer screen color tones differ and matching colors is challenging. However, embroiderers can use online thread conversion charts that permit the converter to generate thread color suggestions. Check the thread type and weight on the embroidery thread chart heading prior to matching. Though Isacord and Madeira primarily manufacture polyester embroidery threads, these manufacturers also produce cotton, metallic and rayon threads. Make sure both charts are the same embroidery thread type and weight for best results. Check the finish of the threads on the heading of the thread sample chart. If you are viewing the charts online by visiting websites like Embroidery Online, PDF Geni or Needlepointers, read the thread chart heading to ensure the selection is your desired finish. 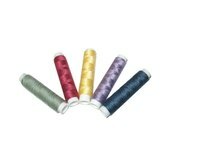 For instance, polyester thread has a high-sheen finish. Read the embroidery thread color number listed below the thread swatch. For example, Isacord lists Petal Pink as #2250 and Madeira lists the same color name as #1713. Make a list of the Isacord embroidery thread colors for matching. You need this information to activate the online thread chart converter. Though manufacturers often use the same color names, a matching name does not necessarily guarantee the thread colors are a match. Visit an online thread conversion chart such as Thread Chart (see Resources). Select Isacord from the drop-down menu as the manufacturer to convert from. Plug in the thread numbers your previously wrote down. Generally, the site generates different color swatches of the selected thread color number as an alternative prior to the conversion. Choose Madeira from the drop-down menu as the manufacturer to convert to. Again, make sure you select the proper thread type. For example, Madeira Burmilana is different from Madeira polyneon or Madeira rayon. Click on the color swatch generated previously to activate the conversion process. The website then generates several Madeira thread swatches with color names and numbers for you to view. Repeat the process until you are satisfied with the color selection. Hard-copy thread charts are available directly from the manufacturer and vary in price. Isacord manufactures precision-wound high-quality polyester thread with tensile strength and color-fastness resulting in smoothly stitched embroideries. Madeira developed a specific raw material within the polyester embroidery thread that prevents puckering or looping and reduces thread breaks during embroidery.